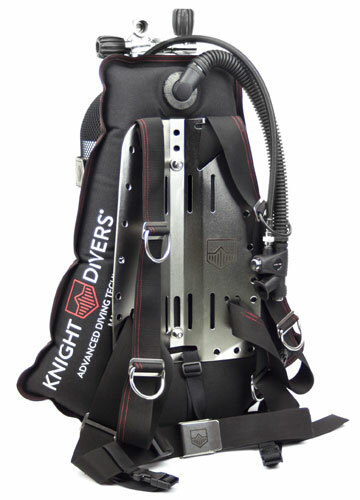 Knight Divers offers superior dive equipment that is technically progressive, exceptional quality and uniquely designed to offer divers the ultimate under water experience, based on comfort, safety, lightness and personal security. We work every day with commitment, conscience and dedication to allow all divers, regardless of the level of experience gained and the level of technical knowledge acquired, to dive with maximum safety, implementing the comfort, lightness and strength of our BCD. We use exclusively the most resistant and innovative materials made in Germany and Italy and applying the most modern processing techniques under strict quality controls. All our BCDs are manufactured in Malta, subject to rigorous tests and CE certificates according to the most recent legislation in force. The goal that we set was to create a new wing which is simple to use and that could guarantee all divers a better trim and greater safety. This goal could only be achieve in one way: thinking outside the box. To create a wing of such advanced shape and performance, we have applied the mathematical rule that governs nature: the Golden Ratio. This complex, mathematically forward ,design thinking has given life to a Wing with a perfectly asymmetrical shape that offers the diver the best possible trim. This particular geometry allows the wing to maximize the thrust in the belt areas allowing the diver to have an optimal trim. To achieve our minimal design we have maximized the air zones, eliminating dead zones in the central area, in such a way as to reduce the size of the whole wing. This has produced a more hydrodynamic wing that guarantees a reduction of physical effort and therefore of air consumption and nitrogen accumulation, allowing longer and safer dives. Our wings are all produced using tubeless technology. This simple but effective technology, derived from the automotive industry, allows in the event of a puncture, the loss of air is reduced to a minimum so that the wing can still continue to operate. Conventional wings, with inner bladder, generally do not allow this and your safety can be seriously compromised. Thanks to a particular process used to bend the webbing in the chest and armpit area, our harness offer unparalleled comfort and versatility, following the natural shape of the body. With a modular system, the harness can easily be customized with the hardware of your choice. Designed to last in extreme marine conditions, such as exposure to sun UV rays and cold salt water, that divers endure, an oversized and extremely high quality, durable thread is used for all trims. Specific stitching, tailored for high resistance, ensures safety and provides a durable, long lasting product. The welding process used to manufacture a safe and durable diving jacket is vital. Particular attention and precision is paid to the process, ensuring that we provide an inner profile, welded in three different ways, to provide threefold safety. An outer profile of unique, wider welding reinforced by an edging of durable stitching of high resistant thread maximises safety and comfort. A classic model was applied to our backplate design allowing all components to be easily interchangeable. All our backplates are produced in Italy, using only the highest quality stainless steel, electrochemically polished using state of the art methods, to maximise longevity. Aluminium backplates have a hard anodization of 40 micron instead of the normal 7 micron which gives them a superior surface quality. This is evident by the colour of the aluminium. The stainless steel bolts have been fitted using polyurethane washers that drastically reduce galvanic corrosion so your aluminium backplate will last for years. Heavy duty Cordura 1100 DTEX, internally coated with Polyurethane and manufactured in Italy in compliance with the highest quality standards, has been used for the standard version of our diving jackets. The TEK version has been manufactured from military grade material, which provides an enduring sleek skin that is extremely robust, resistant to cuts and abrasions, quick drying and provides a reduced risk of bacterial growth. We have selected the best quality K-inflator made in Italy. A latest model of an ultra low profile elbow with an elliptical shape has been utilised. Our corrugated is equipped with an internal stainless steel safety cable to prevent hyper-extension. Due to the central positioning on the back centre to the neck, the inflator is in a protected area which drastically reduces the risk of corrugated trapping during even the most demanding dives. Another advantage of this positioning is that the air inserted inside the wing is distributed equally from both sides allowing a well-balanced layout and the corrugate does not interfere with regulator 1st stage. Our inflator is CE certified according to the most recent regulations. We have selected the most innovative dump valves on the market with ultra low-profile and carbon fibre disk. The dump valve is positioned in front to the lower left side, in an easy accessible area. Our dump valve is CE certified according to the most recent regulations. To create our Evoluted Shape, we applied mathematical knowledge based on the philosophy of the Golden Ratio. This complex, mathematically forward, design thinking has given birth to a perfect asymmetrically designed wing that gives the diver the best balance possible To obtain our minimal design, we have eliminated all the dead zones in the central area of the wing by maximizing the air zones in such a way as to reduce the external wing volume, thereby reducing drag with an evoluted hydrodynamic shape. This ensures a reduction in physical effort, air consumption, and nitrogen accumulation, which results in greater comfort, less physical stress and improved air supply, allowing longer and safer dives. Our wings have all been manufactured using tubeless technology. This that in the case of a puncture, the loss of air is minimised so that the wing can still be functional. Conventional wings do not allow for this, and your dive experience can therefore be compromised. The welding process used to manufacture a safe and durable diving jacket is vital. Particular attention and precision is paid to the process, ensuring that we provide an inner profile, welded in three different ways, to provide threefold safety. An outer profile of unique, wider welding reinforced by an edging of durable stitching of high resistant thread maximises safety and comfort. Heavy duty Cordura 1000 DTEX, internally coated with Polyurethane and manufactured in Italy in compliance with the highest quality standards, has been used for the standard version of our diving jackets. At Knight Divers we believe that your dive experience should be the best experience possible, each and every single time. We are relentless in our pursuit of BCD’s that will offer premium comfort, reliability and robust safety for all divers. Perfection is in the small details and our BCD’s are manufactured from the best material possible to offer an unparalleled under water experience.